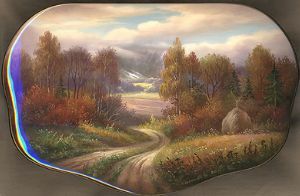 This early Fall landscape scene was pained by talented Alexander Simonov (born in 1960) from the village of Fedoskino. It features locality typical for Russian countryside. It is filled with hills covered with grass and bushes, the small winding path crossing a small forest. We can see rays of sun are coming from the cloudly skies and getting to the fields. Different shades of gray, yellow and green suitable for reproduction of an autumn day have been used here. Mother-of-pearl is inlaid into one part of the composition. It is inlaid in the portion of the sky/forest. With the help of mother-of-pearl the artist has achieved the beautiful effect of the sky's brilliance. The scene is framed with a gold line, the same as the sides of the box -they are decorated with 2 parallel gold lines. The exterior bottom of the box is covered with black lacquer and the box's interior is covered with red lacquer. The box is constructed from paper-mache. The lid is hinged from the top of the composition, and the box rests on "waved" legs. The box is signed with the artist's name and year of 2010.